Wed, Feb 6, 2019, 09:31 pm SL Time, ColomboPage News Desk, Sri Lanka. 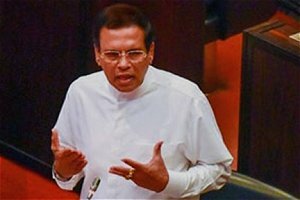 Feb 06, Colombo: Sri Lanka's President Maithripala Sirisena stressed in parliament today that the death sentence would be implemented within the next two months on those who are convicted for drug offences, ending a 43-year moratorium on capital punishment. The President urged the human rights groups not to appear on behalf of the convicted drug traffickers and control the penalties when the death penalty is implemented an requested to assist the government to create a disciplined society. President Sirisena said human rights groups criticize when small countries like Sri Lanka are trying to control crime while many larger nations carry out executions. He requested the countries that bring forward the human rights when punishing criminals not to scuttle his plans to control crime in Sri Lanka. The President said in order to bring about discipline in the country, strong rules and regulations are necessary to curb crime and maintain order. The President made this special speech in the House today (06) when he visited the parliament to comment on the reports of the Presidential Commission of Inquiry to Inquire and Investigate into Serious Acts of Fraud and Corruption (PRECIFAC). Speaking further, the President said the Welikada Prison had become the headquarters of distributing drugs around the country and a decision had been taken to transfer all prisoners to the high security Angunakolapelessa Prison. The President also said the truth regarding the plot to assassinate him would be revealed in two weeks. He said he also had given a statement to the CID on the assassination plot a few days ago. He said the CID will hand over its report in two weeks' time to the Attorney General and then the people will get to know the truth regarding the plot to assassinate him. The President said, the future course of action with regard to the investigations will be taken by the Attorney General's Department.